All prices are in Canadian dollars. We use the total number purchased (ELM382P + ELM382SM) for the calculation. 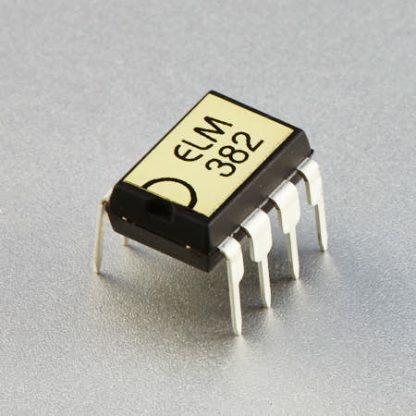 The ELM382 is a digitally configurable, multi- stage counter circuit in a single 8 pin package. When connected to a 50Hz source, four time periods from one hour to one week are possible, as shown in Table 1 below. Although the circuit has been optimized for a 50Hz input frequency, it is capable of being operated over a very wide range of frequencies. Of particular interest is the ability to interface directly to very low frequencies with varying waveforms due to the use of a Schmitt trigger input circuit. The ELM382 provides two outputs – a standard 50% duty cycle divider output, and a momentarily pulsed output. The pulse output is useful for audibly or visually signalling the beginning of a time period, or as a trigger for other circuitry. Refer to the Example Applications section of the data sheet for two typical circuits.